The second day of the tournament brought two games, the first an easy 6-0 victory against Åkra Idrettslag of Norway. The second game was the final and deciding match against Trudovye Rezervy of Russia. The boys needed only a point from this game to make it to the next round, but, as any fan of the Azzurri will tell you, going for a tie is a dangerous proposition. 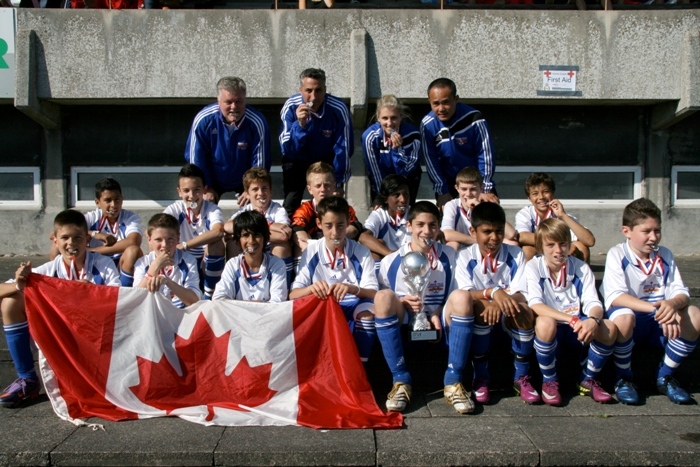 However, in this case, a hard fought 0-0 battle propelled the Tulis boys in royal blue to a spot in the quarter finals. Another Norwegian side awaited the Tulis boys in the first knock out stage. Again the sons of Norway found themselves outmatched as they were easily dispatched in a unimpressive 3-0 game. The lack of drama in this round was not repeated in the semi-finals against the Americans of Marin FC. The scoreless first half belied the intensity and action of the first half which would then spill over into the next half. As the final whistle approached and extra-time seemed inevitable, a crushing last minute strike sent Tulis to the finals for the first time in two years. 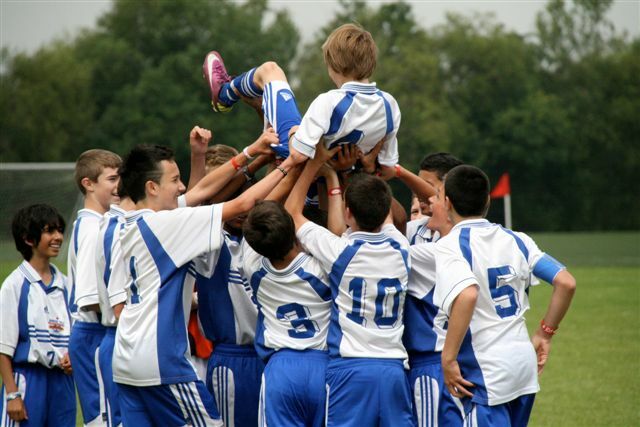 Their opponents would be STD Bremerhaven of Germany, a re-match of the 2009 Dana Cup in which the Tulis boys were victorious in an amazing 1-0 extra-time victory against a much larger German side. This time, however, history was not to repeat itself, as the Germans were able to nurse an early 1-0 lead to the dying minutes before adding an insurance marker for a 2-0 victory. 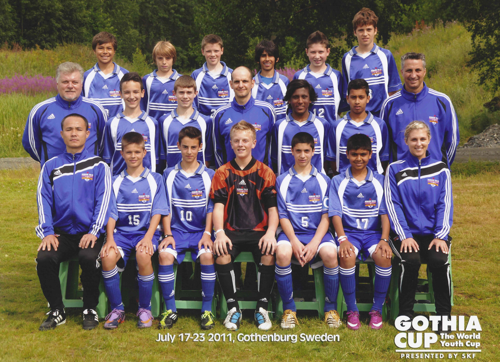 There was no time for regrets as the boys were settling into their rooms in Gothenburg, Sweden before dinner the same day in preparation for the Gothia Cup. 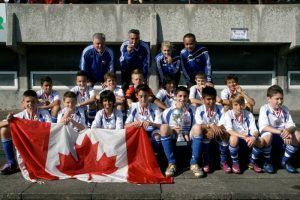 This tournament is the biggest of its kind in the world with over 1,500 teams, 35,000 participants and 70 countries taking part in 2011. The boys started the tournament against the Swedish side BP Svart and looked tired in a 3-0 opening loss. While they may not have deserved a win, the game was much closer than the score would suggest. After the match, the boys and the rest of the touring group, along with 58,000 others, enjoyed the spectacle that is the opening ceremonies for the Gothia Cup. An event that is one part opening ceremonies, one part stadium concert, and many other pieces including fireworks, dancing and, on occasion weddings; the Gothia Cup added an exclamation point to how large and international the tournament was this evening. After the late night show, the boys were to face top tier Swedish side GAIS. Despite playing some of their best soccer to date, the boys could not find the back of the net and were frustratingly forced to settle for a 0-0 draw. This meant that their next match would require a blow out to make the knock out stage. Despite achieving this goal with a 7-0 victory against Beirut FAC of Libya, the boys found themselves on the wrong end of a tie for second place with a goal difference that placed them in the B Cup. As they would soon find out, they were not the only strong side that suffered some bad luck to be put in this pool. The boys’ first match was the first of three to be played on that day and they opened the knock out stage with a convincing 2-0 victory against Swedish side Täby IS. This was followed by a 4-2 penalty shoot-out victory versus another team of Swedes, BK Kenty, setting the stage for a quarter-final clash with the Brazilians of Imaculada/Batista. This was the third and final game of a gruelling day for the boys in blue and it seemed as though neither side had the energy left on this night to send the other packing. Penalties would be required again to decide who would be off to the semi finals. It was a Tulis day as they once again were on the victorious side of a 5-3 penalty shoot-out win. Early the following morning, the Tulis boys faced International SA of Singapore, a team that was undefeated thus far in the tournament following three draws in the group stage. This was a fate even less lucky than losing out on goal differential. With a place in the finals at stake, both teams battled hard but neither goalkeeper could be solved and the Tulis boys were soon in their third consecutive penalty shootout. The first five PKs solved nothing and the match progressed to a sudden death stage. Goals and misses were exchanged equally until the 11th round of the shootout, with the score 6-6. There would be no third victory on penalties for the Tulis boys as they could not match the final Singaporean tally with one of their own and they fell just short of a chance to battle for bragging rights. This ended a long and gruelling trip that had its highs and lows. 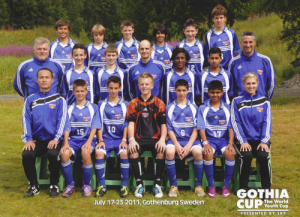 A trip to the finals in the Dana Cup and a second place trophy followed by the disappointment of missing out on the top level of the Gothia Cup only to play an additional 5 games before falling just short of playing in another final. Once again, the game of soccer mirrored the great game that is life and gave a great group of fifteen friendships and stories they will not soon forget.